Victoria Beckham's New Short Pixie Hairstyle. Victoria "Posh Spice" Beckham's new short pixie hairstyle - how it is cut and styled, find out if it suits you and learn how to pull off an extra short crop like this! Victoria Beckham aka Posh Spice, known for her mega-popular "Pob", has chopped off her tresses into a short brunette pixie haircut with barely-there, wispy bangs. It seems that more and more celebs are getting their tresses chopped to just inches to show off their fab facial features and Victoria shows that even the shortest of short cuts are super chic. Her hair has been layered and razored all over, closed-cropped at the sides and neck, hair cutting technique which added more volume to her fine hair. This carefully cut crop is super short but still very feminine with great glossy shine and really shows off her strong bone structure, making it a perfect inspiration for those daring ladies looking for on-trend haircuts. Another great thing about Victoria's head-hugging crop is that it is fairly low maintenance in terms of styling. A good cut should style well, but using some products that give light texture and shine is important - only a dab of wax or serum to add texture and definition. A great low maintenance style which will need regular trims to keep it looking fresh. 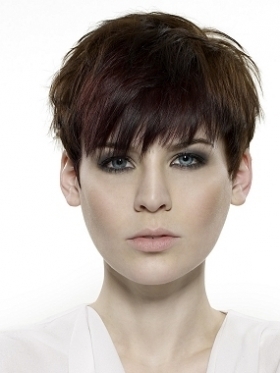 Pixie crops are great for women with baby-fine strands and delicate features. The face is emphasized with this cut, so you should feel good about your skin and your features if you're going to try this style. It's a great option for women who want to project a strong yet feminine image and spend less time managing their hair. The pixie also is a style that can take really strong makeup, so play up your eyes with smokey shades for head-turning results.